In the past, if a customer wanted to complain about your car dealership’s service, they would either pay it a visit, pick up the phone or write a strongly-worded letter. Now, they have a public platform from which to air their dissatisfaction. Poor online reviews are an element of customer service that most businesses have had to come to terms with. When complaints were direct, they were manageable, and could be dealt with away from the public eye, but remedying a poor online review is much more challenging, and if handled incorrectly, can significantly damage the brand. In this post, we look at five steps to deal effectively with negative online customer reviews. When you first spot a poor customer review, it can be tempting to jump straight onto your keyboard and respond. Avoid this temptation. Depending on the nature of the review, you may be in a heightened emotional state (particularly if you feel it was unfair), and that could result in a reply that does more harm than good. Instead, plan your response. Research the complaint and speak to the staff involved. Get your facts straight – and then move onto step 2. Ok, so we suggested above that you need to take a step back before replying, and that remains the case, but it’s still important to reply in a timely fashion to an online complaint. Leaving it too long will suggest you’re either not on top of your online presence or have been scrambling around for excuses. Try and get back to the unhappy customer within twenty-four hours, but do so in the first instance publicly (depending on the platform they’ve used to air their grievance, you should have the option to reply). Thank the customer for taking the time to make their feelings known and express a desire to resolve the matter quickly and to their satisfaction. Remember – the world is watching, so remain professional, fair and customer-focused. The public reply is vital, but a private message (be it via the review website’s messaging system or an email) will give you the chance to go into more detail than you would within a public arena. Thank the customer again, apologise for the fact they felt the need to complain and tell them you’d love to have the opportunity to put things right. Briefly note your findings from the research you carried out in step 1 (without succumbing to the temptation to throw any blame their way) and ask if you can contact them directly. Assuming the customer gets back to you (if they don’t, and you have their contact details – get in touch proactively), follow up on your promise and make contact directly. By dealing with the complaint offline, you’ll avoid any further potential brand damage online, which means you’ll have left that arena demonstrating a desire to put things right, and have the customer where you want them – in direct contact and able to hear your proposed solution. Don’t let this episode put you off. On the contrary, make sure it pushes you to encourage more reviews, in order to build a venerable online profile of happy car buyers. Empower sales staff to request reviews from their customers, and periodically send out email campaigns that point past buyers in the direction of the review sites on which you’d like to raise your profile; show that you’re not afraid of such platforms. Online reviews are a vital asset in the automotive sector, and should be a key part of every dealership’s strategy. 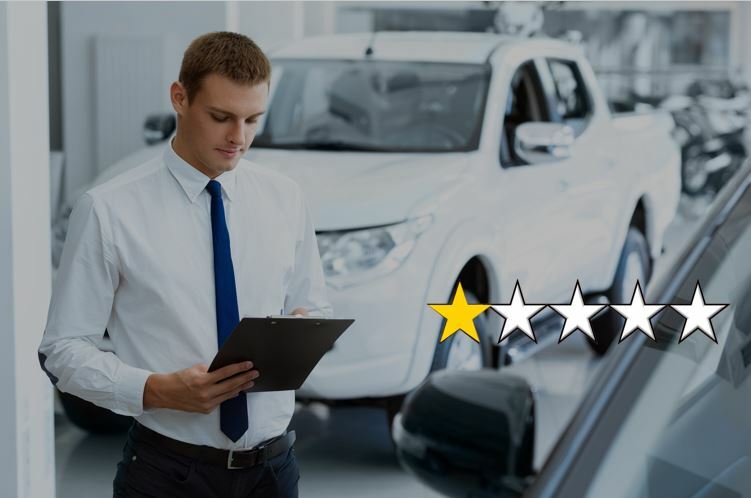 Poor online reviews are damaging for your business, but if you fail to deal with them in a structured, timely manner, your inaction could present far greater problems for the dealership’s brand. Use our tips above whenever a poor review strikes (which, inevitably, it will at some stage), and you’ll turn the episode into an opportunity to show the world what your business is made of.